Designer and animator Eduardo Souzacampus has created a delightful series of simple paper toys which he calls "Tubeland". 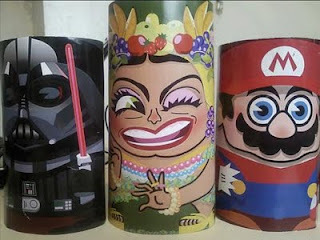 Each of the toys is assembled by rolling a single piece of paper into a tube, then gluing it in place. Pictured above are the paper toys representing Darth Vader, Carmen Miranda, and Nintendo's Mario. A wide range of pop culture characters are available including historical figures (Da Vinci, Mozart, etc), cartoon characters (Betty Boop, Flintstones, etc), and soccer players (Pele, Ronaldo Fenomeno). One of my personal favs is the Heath Ledger Joker paper toy. All 24 of the Tubeland paper toys may be downloaded here. 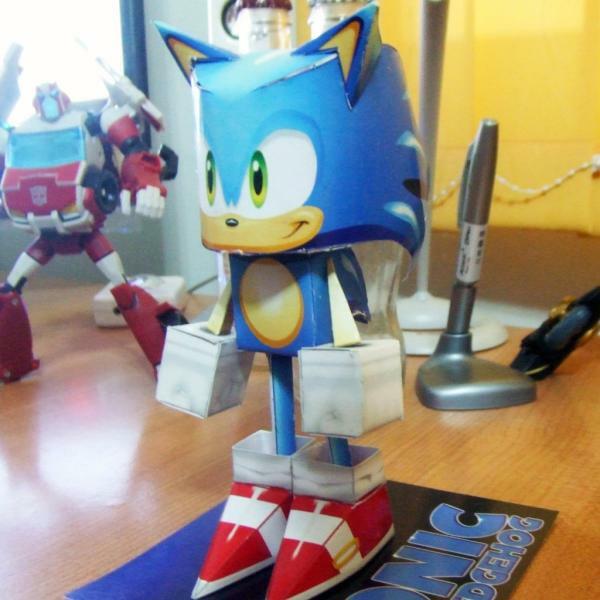 Here's a Sonic the Hedgehog papercraft that was designed from scratch (no use of 3D models from video games here ^^). This paper Sonic was created by deviantARTist cheetor182 for a class at school. A download of the template for the paper model is available here. Paper toy designer Luis Renato Kriegel has created a super cool set of X-Men paper toys based Brian Castleforte's Headkase paper toy template. 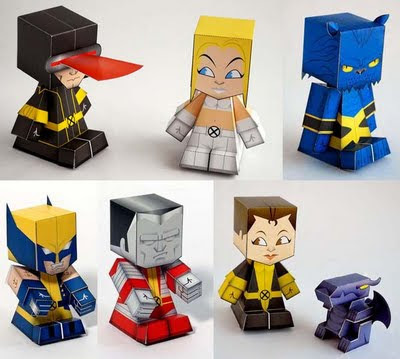 Pictured above (left to right) are paper toys of Cyclops, Emma Frost (White Queen), Beast, Wolverine, Colossus, Kitty Pryde (Shadowcat) and the alien dragon, Lockheed. Printable templates of each character are available in the "Free Papertoys" section of Kriegel's website. Scroll through the images to get to the goods. In Marvel Comics' new Thor movie, the god of thunder's war hammer Mjolnir is given a more ornate look than the comic book version of the weapon. My friend George at the Behold the Geek! 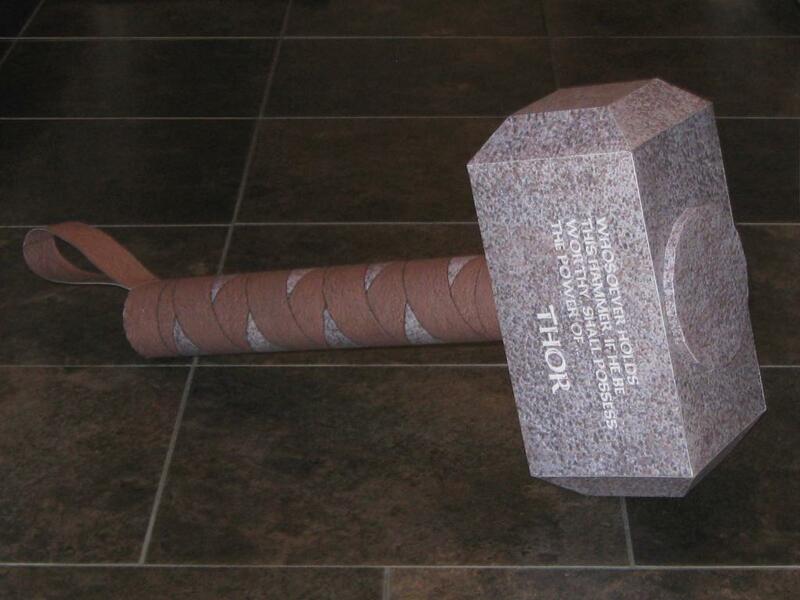 blog took it upon himself to create a full scale paper model of the movie version of the hammer. George based the construction of his hammer on my own 1:1 scale Mjolnir papercraft. The template for the movie Mjolnir is available here. 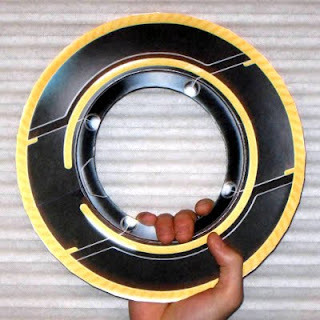 Note: 11x17 size paper or cardstock is required to build the hammer full size. The AH-64 Apache attack helicopter is used by the militaries of several nations around the world. 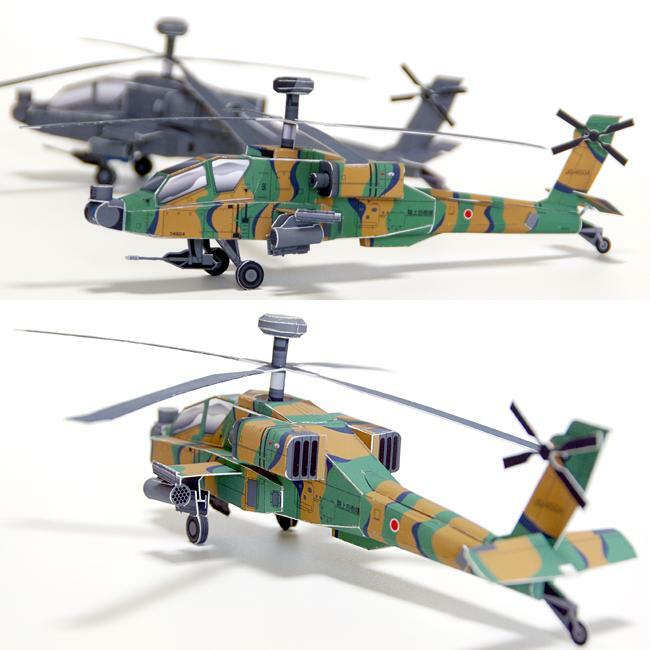 This 1:72 scale paper model of the Apache comes in two color schemes. The first scheme is the woodland camouflage used by the Japan Ground Self-Defense Force (JGSDF). The second scheme is the standard olive drab color used by the US Army. 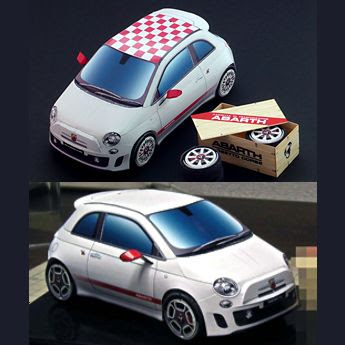 Templates and detailed instructions by Japanese papercraft designer Kushimaru may be downloaded here. This is my papercraft treasure chest offering for the month of May. It is the fourth chest in my ongoing series. As you may know, each area in the Kingdom Hearts 2 video game is based on a different Disney movie. This treasure chest is located in the Port Royal area of the game which is based on the movie Pirates of the Caribbean: Curse of the Black Pearl. Your ally in that area of the game is none other than Captain Jack Sparrow! 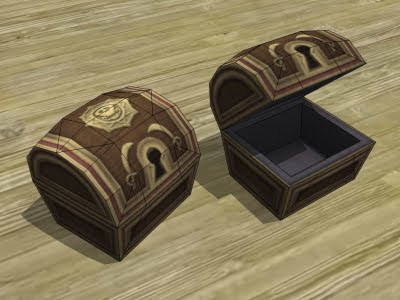 The template for the Port Royal treasure chest may be downloaded here. 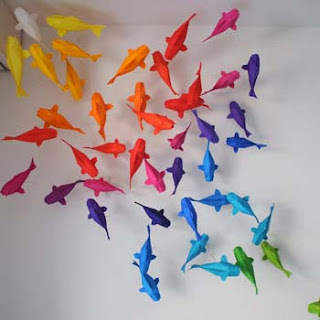 These koi fish by origami artist Sipho Mabona have lots of decorative possibilities. In the photo, several different colors of the koi are suspended from wires to give them the appearance of swimming in a pond. Folding the koi is relatively easy. An excellent stop motion video here by Mabona shows how the origami fish are each folded from a single square of paper. Some papercraft can begin to approach fine art status. 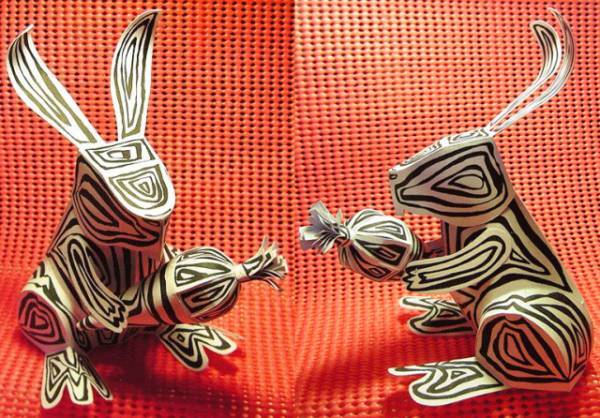 This line art rabbit paper toy might be considered one such example. 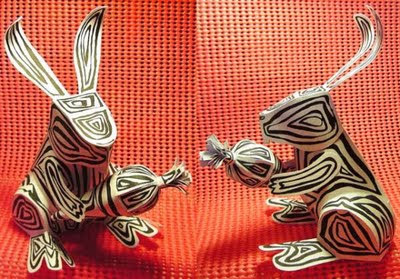 Created by artist Cherdpong Sikkhajareon, the rabbit is covered with ink line work inspired by certain types of Thai art. A free template for the paper toy is available here. 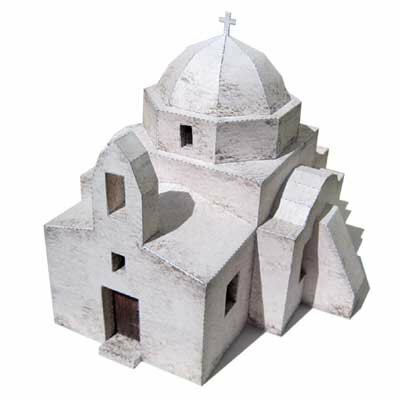 Pepachal has added to their collection of paper models of ruined churches. First in the series was an Irish stone church, followed by an English brick church, and now we have a whitewashed Greek church. I did some research and it appears that this model is based on a cemetery church near the village of Apiranthos on the island of Naxos. Pepachal's main page has links to templates for each of the churches mentioned above. UPDATE 3/17/15: There has been a change at Pepachal. Only the most current model in the series is free. The older models (which includes the church above) must now be purchased. Papercrafter MarianoDG has added yet another character to his long list of superhero paper models. This time is it is none other than Superman! 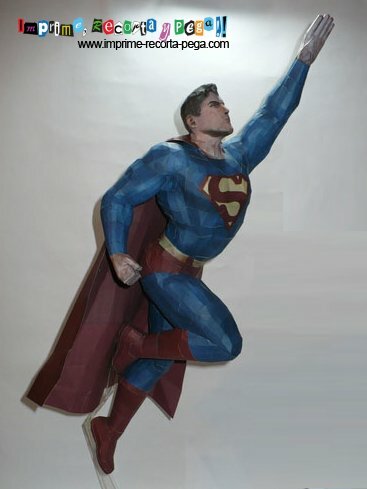 Mariano's papercraft of The Man of Steel is based on a 3D model from the Mortal Kombat vs. DC Universe video game. As you can see from the photo, the model shows Superman in his classic flying position. Because of this pose a special base (included with the template) is required to display the model. The finished papercraft stands (or should I say flys? ^^) at about 19" (48 cm) tall. The RAR file download for Supes includes a twelve page template in both PDF and Pepakura PDO format. These two paper models of TARDIS interiors are the creation of Philip Lawrence. Philip runs Action Figure Theatre, a website devoted to creating online Doctor Who comic books constructed from photographs of action figure toys. On the left is the 80's version of the tardis used by the 5th, 6th and 7th doctors. On the right is the tardis as it appears in the 1996 Doctor Who movie which features the 8th doctor (look for it be released on DVD in the US later this year). Both of the papercraft models are scaled to fit 5" action figures. Downloads of the templates can be found here and here. Ever since I released a 1/2 scale Mjolnir paper model back in 2008 I have gotten requests to make a full scale version of the hammer. So to celebrate the release of the new Thor movie this week, I am finally honoring those requests and releasing a 1:1 scale version of my original Thor hammer papercraft. When I created the original model I attempted to make it the "official" size according to Marvel Comics. The full scale model may seem a little large at 21" (53 cm) long, but you have to remember that this is the weapon of a 6'-6" (2 m) tall, 650 lb (295 Kg) Norse god. ^^ The full size template for Mjolnir may be downloaded here.